Just as he did with the pilot for "The Wire," David Simon (there with Ed Burns, here with Eric Overmyer) has no problem plunking his audience down into the middle of what's a foreign country to many of us and assuming we'll pick up the language as we go. So we open with two men (who turn out not to be significant characters) haggling over the fee for the second line parade, and our first familiar face in Wendell Pierce doesn't even turn up for several minutes. We don't get an explanation for what a Mardi Gras Indian is, but instead just see Clarke Peters strutting down an empty street in that amazing yellow feathered costume, looking like a cross between an Indian, an alien and a crazy person. You just go with the music, or you don't. As I watched the "Treme" pilot, I had enough faith in Simon and company to know that I'd figure things out eventually, and now having seen three episodes, my faith has been rewarded. And because "Treme" is, so far, much more driven by character than plot than "The Wire" was, I had a much stronger sense of the main characters by the end of the pilot than I did about anyone but McNulty by the end of the first "Wire." Clarke Peters played my favorite character on "The Wire," and he quickly establishes Albert as one of the ones to watch closely here. There's that great moment where Albert enters his ruined home and with a few small gestures (a catch of the breath, a change in his eyes), Peters shows you just how much it wrecks him to see that. But then he steps outside, his jaw sets, and he becomes this immovable object - a big chief who isn't going to let his daughter, his son or anyone else stand in the way of his plan to clean out the bar, reassemble his old tribe, and start rehearsing for Carnival. It's a calling he takes so seriously that he won't even let himself break character when his neighbor agrees to haul the junk away from the bar, only allowing himself a little goofy victory dance after the street is completely empty. We spend a lot of time in the pilot just watching musicians performing their craft. In the same way that "The Wire" would occasionally step back and just let us witness the cops perform their jobs at a high level, the long musical interludes are already revealing things about the characters: that Antoine, for instance, is so desperate for money that he'll perform in a parade he's clearly not in shape for. And through it all, we see both the heartache and joy of post-Katrina New Orleans. Homes are destroyed, lives are lost or uncertain (like Ladonna's missing brother Daymo), yet there's great music and food and companionship and local pride. There are gigs to hustle for, consignment CDs to be reclaimed, victory dances to do, and money to be played for. It's a place where even the funerals eventually turn into celebrations with dancing and music, and one I look forward to spending a lot of time visiting this season. • Elvis Costello (who generated my biggest laugh of the pilot with his reaction to Davis's attempt to claim that he taught Kermit Ruffins anything) was one of the first famous musicians to come back to the city after the storm, where he began work on his "River in Reverse" album with Allen Toussaint. And Kermit himself is a local fixture whom Mills once described as "the de facto goodwill ambassador of New Orleans... except he rarely travels to ambassadorize." • When Creighton declines the lemon ice (out of loyalty to another restaurant that has yet to re-open), the desert that Janette offers to fix for him is a Hubig's fried pie. In his open letter to the city of New Orleans in today's Times-Picayune, Simon cops to the fact that the Hubig's factory didn't reopen for several months after the time period depicted in this episode. • And speaking of the Times-Picayune, if you like this show, you really owe it to yourself to check out some or all of Dave Walker's exhaustive coverage of the show. • We don't get an explanation here for Davis's issues with his gay neighbors, but note that he assaults them with the music of New Orleans native Mystikal. • I found it a nice touch that Toni carries around three giant purses all the time, which is a reminder not only that she has no office to go to because of the flood, but also suggests a character who's always over-extending herself. • I know it's been 10 years and many films since Rob Brown made his movie debut in "Finding Forrester," but when I saw him as Delmond tearing it up at the Blue Note, I was overcome with the urge to yell out, "You're the man now, dawg!" in a Scottish accent. As a seasoned Wire viewer I enjoyed myself. But following The Pacific and airing an inflated pilot is gonna kill the show. Any particular reason that Goodman's billed as a guest star? I'd been under the impression that he was one of the main characters. Personally, Anonymous, I think that airing the pilot after the Pacific will guarantee that Treme will get bigger viewership than The Wire. I believe Goodman was hired very late in the production process, and it may have been contractually easier for them to do it as a guest star. He's in all three episodes I've seen. Lemme be the first to say it's wonderful to see you here, Alan. Not like anything else was expected, but you helped make The Wire even better -- a superhuman achievement -- and it's great seeing you here. Because of the way in which The Wire started, I knew that I will have to be patient with Treme. As a result I could not have been let down with the premiere. That said, I loved it. The music was fantastic and now I really want to go down to New Orleans. It's great to see Bunk and Freamon back, though it will take some time getting used to their new characters. I love how uncompromising David Simon is. You are right, Alan, in that Simon just throws us into this culture without any context or explanation. Like The Wire, some of the conversations are incomprehensible at times, though we will eventually catch on to it. And he doesn't explain things that are ingrained in the NO mindset (Mardi Gras Indians, tribes, Hubik's, second line). I haven't been this excited for a new television show in a long time. Was the actress playing Clarke Peters daughter the same actress that played his love interest in The Wire? Nope. That actress did play Omar's stick-up girl colleague that got killed in season 3, however. Thanks! I knew she looked familiar, but I couldn't find her on imdb. I'll have to try again another night when i have less on my plate but honestly it did nothing for me at all. I haven't seen the Wire, so maybe Simon's throwing the viewer in head first was too jarring for me. but honestly i think confusing the veiwer and hoping they'll stick it out until it makes sense feels like an error in storytelling to me. Why should I stick around for this? Marquis, The Wire took a few episodes to get under one's skin with its slow build and dense characters. But once it took hold, it *really* took its viewers on a ride. Tough to disassociate The Bunk and Lester Smooth from prior incarnations, but Simon has earned every bit of attention I can give to something, so I'm in it for the long hall. It seems like Zahn and Goodman are playing two aspects of Harry Shearer. Simon should have just hired him to play himself. Hey, I loved this! The abundance of music is awesome; I hope they come out with a ton of soundtracks. The Treme pilot was beautiful. I haven't thoroughly enjoyed an hour and a half of TV this much in a long, long time. I'm a big fan of The Wire and Bunk and Freamon were my two favorite characters. Glad to see them here. That Steve Zahn bit where he was blasting Mystikal out the window at his neighbors was classic David Simon. There wasn't even a single line of dialogue in that scene yet it was riveting (reminds me of the classic 'F' scene from season 1 of The Wire). NO is one of my favorite cities. I don't think there is a spot in America that has as much culture as that place. It feels like an odd hybrid of America and some sort of unidentifiably foreign city. It's a shame that we largely ignore what happened to the city and neglect how it still hasn't come close to a full recovery. After seeing the 1st ep of Treme I got high hopes for this series. With the Pacific and Treme, it is safe to say that HBO is back! This series feels incredibly real and true to the culture. I don't know these people yet but I think I will like them and I already love their world. I think I actually forget how rich and unique the culture of New Orleans is. Ths show reminded me of things I forget about, little things like the fact that red beans and rice is eaten on Mondays. Describing it as a foreign country is pretty close. Kermit doesn't tour (much?) but Rebirth comes up to New York pretty often. I highly reccomend checking them out. They bring New Orleans with them and the crowd is always full of New Orleanians. They have a special place in my heart and were there for many of my favorite college memories. One of the best Rebirth memories: seeing Rebirth at the nightclub Kermit Ruffins was then operating out of his house in Treme. It was Monday so there were free red beans and rice. Thanks Kermit. Watching this show made me want to move back there but also made me feel like I don't have to because I can watch next week. So remember what I posted last night about Dave Walker's outstanding coverage for the Times-Picayune? Double that for his annotations for the pilot episode, which gives you background on virtually every local detail from the episode. The Wire's final season had a lot of meta elements in it, too. And Generation Kill had Evan Wright as a character. I don't think it's gonna happen, but it's a fun idea. I ended up watching Treme instead of Breaking Bad and I don't regret it. The music was wonderful and I love the way the pilot was shot. Clark Peters didn't have many spoken lines, but he conveyed so much of what he was feeling through his eyes, stance, and even his dance. Admittedly, I wasn't a Bunk fan, but Antoine is my favorite character of Treme. Can Wendell Pierce really play the trombone? Khandi's character is refreshing, as is Kim Dickens' character. Actually, I'm sold on all of the characters except for Steve Zahn's Davis are great, but this is just the pilot. Now I'm ready to go back to New Orleans. I was expecting this episode to be a bit of a chore and braced myself of a few weeks of homework before really "getting" Treme, but it was simpler than expected. It's probably because of all the media analysis and hype, as I found I was able to remember most of the characters names and situations as the episode went on. A broad smile came to my face as I recognised parts of the Bunk and Freamon in both Antoine and Albert (I think that's his name.) It was strange seeing Clarke Peters in such a magnificently brash outfit, as he is Lester Smooth, reserved and receptive making his doll house furniture in the corner, but his performance was great, especially when first seeing the ruins of his old house. I thought he would just wedged in to the show as an actor Simon brought over from Baltimore, but I'm now really looking forward to seeing him more now. With the Bunk/Antoine, it is just the voice that kills me, every time. If I ever needed a narrator, I'd bypass Morgan Freeman and give Wendell Pierce the role without question. He just has such an ease and confidence flowing out of him, which is great to watch, and made for great banter with the other musicians from the parade and all the way to the episode ending funeral. A lot of time was spent with Davis, who I thought was wholly recognisable and likable at the same time. I like the ratio of holier than thou/trying to hard that Zahn played him with and a I appreciated his knowledge of the the music despite coming over as a douche at some points. Nice to see Elvis Costello, who I thought was really funny in 30 Rock, as international art thief Declan McManus. John Goodman, where to start? The man is a comedy goldmine, much like JK Simmons is, he just doesn't seem to try, it is a comedy of charisma, and he was great in every scene. You can see that his character has David Simon's righteous fire straight away, I'm hoping he isn't just a guest star for the series. Ladonna and Toni were a bit of a footnote in the pilot, but they both seem promising characters. The restaurant aspect hasn't done much for me yet, but any supposed flaws I see now will probably be no more by the end of the season. It was great to hear so much music throughout, even the funeral march, you can tell that the writers and actors have really immersed themselves in the place. One peeve. Why did the journalist have to be British? Is our nationality just shorthand for overly serious and judgmental evil bastards. On reflection, I may have to watch it again but I feel on very good standing with these characters going into episode 2. I thoroughly enjoyed the pilot. I get a real sense of the culture among many other things. I need and want to re-watch again to pick up any nuances that I may have missed. When I worked in corporate arena, I spent two years-one is Chicago and one in New Orleans. I loved New Orleans a great deal. I love the people, food, music, history. George, I liked your character analysis and mostly agree. Nice to see you here too, Alan. I hope all is going great! I'm in. The music had me hooked from the beginning, and the characters will keep me coming back. Good work by all. @marquis - You should stick around because each episode of Treme builds on the last, much like the way in which the history of New Orleans itself is enriched by the ways in which it builds, rebuilds, and builds some more on its own roots. If things seemed shallow or unexplained in this episode (like Davis's disdain for his gay neighbors), it's only because Simon and Overmyer don't want you to simply be some Wisconsin-yokel of a tourist, thinking they can just tune in once and suddenly "know" the "real" New Orleans. Having also seen the first three episodes, I can tell you that the third episode, "Right Place, Wrong Time" is one of the best hours of television I've ever seen, and you should at least stick with the series up until that point. I'd link to my review, but it covers the first three episodes and I don't want to spoil anything. Does anybody know if Treme will be offered on itunes or on demand for people without HBO? I'd really like to see this but don't have HBO. I didn't know what to expect....I watched after THE TUDORS and before the 11:30 rebroadcast of THE PACIFIC....and I really, really enjoyed this show. Actually you could have named the series LIFE ON MARS if that title hadn't been taken, and it would be accurate. It was as if the viewer had parachuted into a life and culture that was foreign yet very American; an immersion that you adapted to rather quickly. And finding ourselves in post Katrina New Orleans we can feel Creighton's rage at the lack of accountability. The baby steps taken by the music community and the other characters to reboot their lives and a culture that was close to extinction was engrossing. Here in 2010 we know that New Orleans will slowly succeed in recovery, but even in knowing that outcome doesn't detract from feeling for and rooting for these wonderful and diverse characters. And I think I've finally got the pronunciation of "Treme" down pat! Thanks for the Dave Walker link - I've only just started reading all his articles on Treme, but boy, are they fascinating. Sundays have suddenly become a whole lot more crowded. Does anyone feel as drained as I do having to watch Breaking Bad, Treme, and then The Pacific all on the same night? It's bloody fantastic, though my brain hurts just a little from all that tv goodness. What's the over/under date on the first post Alan writes about Treme that doesn't mention the Wire? I would like to retract what the last Anonymous person said today at 2:33 and will no longer post under "Anonymous" as to not be confused with him. Commenting rules, boys and girls. Read 'em, learn 'em, follow 'em. So, is it a good sign or a bad sign that people are being driven to post offensive stuff on the site? I'm glad Alan's moderating, but I'm also thrilled that people think the show's important enough to trickle down their own personal grievances onto it. 'Tis the city of our imagination after all. I was prepared to be let down after all the hype, but I loved it. For me, Zahn's character is the only weak note. The rest was amazing. I sincerely enjoyed the hell out of Treme. Having a character-driven plot and it's heavy use of music, it's like it was custom-designed to please me. I thought the opening credits were amazing with the faded local scenes and faces integrated into the mold on the walls. That really blew me away. Question... is this a mini-series or is it a series that could have multiple seasons? Anyone know? LA, HBO bills it as a series. And Otto, I really think Davis will grow on you. My remote that can draw up subtitles isn't functioning... question: What's the first thing Elvis said to Davis, after Davis' "National treasure." Otto, I really think Davis will grow on you. Glad to hear that. I'm a music buff and a former radio DJ, so he was the character I expected to identify with the most. If you want to see some good free music and aren't annoyed by undergrads, Tulane is having what sounds like a great free music festival. 10 dollars for all you can eat crawfish. Bring your own booze in a plastic container. The lineup is really good, especially for FREE. Dirty Dozen, Trombone Shorty (the real trombone player Batiste's chracter was filling in for), Jon Cleary, Radiators. I'm also going to try to catch the Soul Rebels at Les Bon Temps on Thursday. "If the nation but knew." Can anyone tell me when this episode is supposed to take place. It is not 2010, right? But rather sooner after Katrina. Am I right? Like they said in the opening text, it's set "three months after". I really enjoyed it. I was expecting it to have a great sense of place, but I wasn't expecting New Orleans to feel so completely alien - in a good way. And yet the broad strokes of the story were clear and understandable, even if the finer New Orleans details weren't explained. I look forward to getting a greater understanding of the culture as the season and series continue. Finally watched it last night and I liked it a lot. I can seem myself loving it very quickly. The music will help. I thought Clarke Peters was phenomenal, but I wouldn't expect anything less from the man that gave us Lestor Freamon. I hope the Davis character will grow on me, because I'm not too crazy about Steve Zahn. I hope we get to see some familiar faces from the Wire as this progresses, because I miss my Wire actors. The expression on Clarke Peters's face when he entered his ruined home for the first time was phenomenal. It exactly mirrored my feelings when I entered my own ruins for the first (and last) time Mardi Gras 2006. Watching Sunday night, I, well, teared up. Great pilot ep. Simon has this amazing ability of capturing real life in TV drama's. Wendell Pierce, and Clarke Peters were perfectly cast. I'm guessing will see some appearances from "Wire" alum in future eps. Only David Simon can make a worn out dirty city spectacular. Some great shots of this one great city looking so empty and lost now, just great, looking forward to the rest. 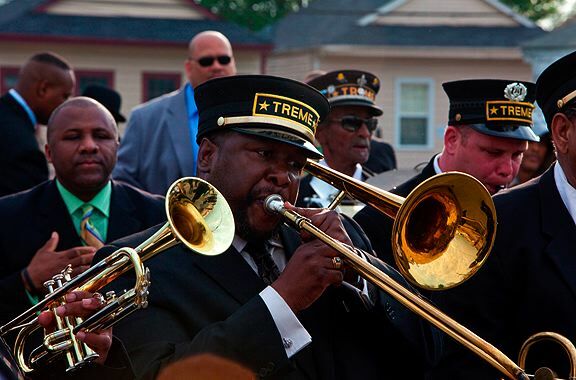 Good news: HBO has already ordered a second season of "Treme." [Y]ou go into a shabeen or a tavern or a pub anywhere in the world, Johannesburg, Budapest, Katmandu, and Michael Jackson or Otis Redding or Fats Domino or John Coltrane -- African American music, which came into the world here, in twelve square blocks, has gone out into the world. And it stands for us. And the cool thing about that is, that's our greatest cultural contribution by far. This thing could only happen because we're mutts. It could only happen because of the American ideal in practice, which is to say that it doesn't happen without European instrumentation and arrangement and it doesn't happen without African rhythms and a blues scale, a pentatonic scale. It could only happen here, and it could only happen through the wonderfully miscegenated American experience. We are all each other, to an extent. This is Simon at his worst spewing his nationalistic rhetoric: "us" "our" "we're" "the American ideal in practice" "here" "we are all each other". (I recommend he read Michael Billig's Banal Nationalism to help free himself from this ideology.) And it is BS. Every culture, including every musical form, and every ethnicity everywhere in the too bloody world is a product of miscegenation. "European instrumentation" and "African rhythms" are as miscegenate as the so-called "American experience." But note especially what Simon leaves out, that "our greatest cultural contribution so far" is in fact a legacy of slavery. Not cool, Simon. Some of us choose actively to reject cultural legacies of slavery that do not make that legacy uncomfortable. Another reason why The Wire was cool. The Wire's brilliant critique of the economic/political imperatives of postmodern capitalist society through the metaphor of "the game," and the inhumanity immanent in the applicability of that metaphor to how society is organized, excised identity politics. Simon explicitly rejected race as important in The Wire as well as internally negating identity politics with rhetorical devices like parallels and the mixing and matching of races, communities, institutions, sexes, and sexual preferences, demonstrating common victimization to the logic of the game. But now Simon's gone and got all cultural on us, and from what he has said it seems Treme has been seeped in jingoism, nationalism, historical ignorance and historical repression. It will be interesting to see where it goes. Loved it! The music was just phenomenal! The only detail that stuck out as odd to me was the fact that none of the musicians seemed to have cases for their instruments. I've never met a professional musician without one...unless it's a NO thing, who knows, I've never been there. Anyone know who is really playing trombone for the character of Antoine? Wendell Pierce can't be THAT good, can he? Also, Anonymous 6:22, it isn't jingoism to say that jazz could only have been born in America - in fact it only could have been born in New Orleans, because of the incredible blend of cultures and influences found there in the 19th century. Not just European and African, but also Latin, Creole and Carribean. At least, according to my History of Jazz teacher at music school. Also, yes, jazz is a legacy of slavery - this is a pretty well known fact. A lot, actually most, of great art, literature and music has come out of periods of great suffering. Calling jazz America's greatest cultural achievement doesn't mean condoning slavery. I watched it again, giving it the same respect I used to give The Wire, and I *got* more of the details, but I cared less. I'm just not so much enthralled with New Orleans as I thought or hoped I'd be. Some of the music is nice but there was one kind of hybrid number, the Louis Prima number (I just looked it) made me want to barf and I had to mute it. I guess it is not a given that I will love every little thing that David Simon loves. Steve Zahn was a little annoying but I started to warm to him over the bottle of wine. Leo looks older, and so do I.
I didn't know The Bunk could play like that. Overall, I dunno- I'll watch again and give it a chance. But please, no more Louis Prima!!!! Based on the reviews, I was expecting something a lot more dense and challenging. That would have been fine with me, but I was surprised by how accessible I found the pilot. The characters were so strongly established that everything else just seemed to make sense to me. (I don't really remember the first episode of The Wire at this point, but I remember it took me several episodes to start understanding what was going on). The cast is so incredible I would watch them in just about any show. now that he doesn't have UBM to troll anymore, this guy is going to try and ruin the Treme recaps? Aaron Riccio: Please see commenting rules re: future episodes. Thank you. Anachronism #1: (and AFAIK, noone's caught it yet) -- When "Lester" and his daughter drive over the Twin Span, you can see the Superdome in the distance ... with it's roof intact. 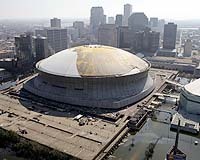 3 months after, the Superdome still looked like this. I'm Australian, we just got the first episode on cable this week. I'm a big fan of The Wire, definitely the show that will always stay with me. Obviously I was excited to hear about Treme. The cold open is beautiful; what an introduction. I've re-watched it about four times since I first watched it last night. I can't get the smile off my face when I'm watching it; makes me really REALLY want to be there, despite the ruin around them. The music in this opening (and throughout the episode) was just sensational. Makes me wanna go dance on a car. The rest of the episode felt strangely familiar; that is, the slow burn. The Wire took a few eps to get me, and the mere promise of that happening again will keep me watching this show.